> French Vanilla Ground Coffee, 1 lb. Every day should start with the great taste and aroma of Dunkin' Donuts® coffee. Make your morning even better by indulging in the smooth, classic flavor of French Vanilla coffee. We make it easy for you to order your favorite flavored coffee online and have it delivered right to your home or office. Dunkin' Donuts® coffee gets people going. Made from a premium blend of 100% Arabica beans, our French Vanilla Ground coffee satisfies your desires for creamy goodness that is both rich and smooth. Need an indulgent moment to yourself? Enjoy the splendor. 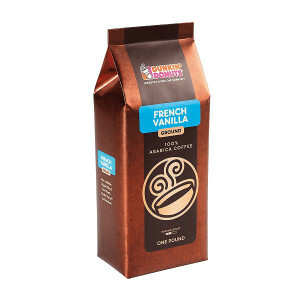 There are over 15,000 different ways to order your coffee at Dunkin' and the best part about having Dunkin' Donuts® French Vanilla coffee at home is your freedom to make it just as you wish. Use less or more coffee grinds to brew a cup at just the right strength. Drink it plain to enjoy the pure flavors of this blend, or add sugar and cream for a sweeter experience. Drink your coffee hot while appreciating the steaming aromas or add ice to have a refreshing beverage that energizes. Dunkin' Donuts® French Vanilla coffee is meant to be savored in your own unique way, so order a 1 pound package for yourself and your friends to find joy in your coffee experience.